Bruce Munro at Montalvo: Stories in Light student extensions will be offered throughout the span of this astonishing exhibition. Based on the standard model of our student ﬁeld trips, these school visits will be an opportunity for students to more deeply engage with the exhibition through a guided tour, then by creating their own artwork in response to the installation. This will shine a light on various elements embedded in Munro’s work. We will offer three, discipline-speciﬁc tracks: Installation Art, Technology, and Literature. After touring the property and experiencing the Bruce Munro at Montalvo exhibition, students will be prompted to explore the conceptuality of installation art and sketch ideas for a work within their community. Referencing Munro’s Bacchus’ Spring, Gathering of the Clans, and Light Shower, students will experiment with common objects as modular units, and create Munro-inspired collaborations. In this STEAM based workshop, students will work within the intersection of art and science. After walking our grounds and experiencing the Bruce Munro at Montalvo exhibition, students will be prompted to explore the use of technology within artistic practices. Taking inspiration from Munro’s Silver Sea, which represents clusters of lilies, students will work through the basics of circuitry to produce their own illuminated stems. How can we connect to a new place or environment through our favorite stories? When Bruce Munro visited Montalvo for the ﬁrst time he was instantly transported to the world of Narnia, created by author C.S. Lewis. 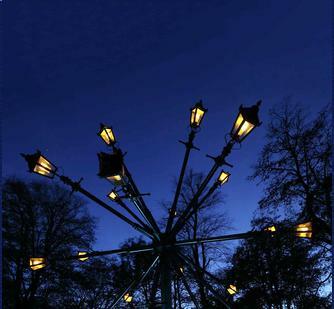 Inspired by these stories, Munro curated pieces to tell the stories of Narnia through the mediums of light and sculpture. In response to Munro’s Dawn Treader, students will engage in a writing and illustration workshop where they will explore the generative process through which narrative gives rise to visuals and visuals inspire new narratives. We're sorry! Tickets are not available online for this tour. Please contact our box office at 408-961-5858, 10am-4pm Mon-Fri information.